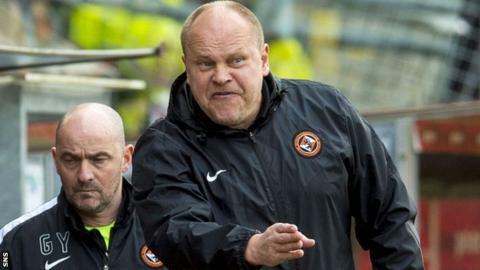 Mixu Paatelainen says he is planning to be Dundee United manager next season - and to help the club rebuild - no matter if they are relegated or not. United are eight points adrift at the foot of the Scottish Premiership with five games remaining. "I have a contract and we have spoken about the budgets for next season and I plan accordingly," Paatelainen said. "There are quite a few issues that need to be sorted, but I won't go public about these things." Former Finland coach Paatelainen took over at Tannadice in October after the sacking of Jackie McNamara and his side have remained at the foot of the table. He insists that his players remain "fighting and hopeful" that they can escape relegation and that he has not turned his thoughts to what he would do if United were in the Championship next season. But the United boss said: "It gives us a chance to maybe make a few changes and have a clean table and build an even stronger base. "That's how I would - and will - think about it. "We've had discussions about these things already. There are a few issues we need to correct and touch. "Whether changes need to be made, that's not always entirely my decision. We want to make sure we are better off no matter if we stay in the Premiership or go down." United face Hibs in the Scottish Cup semi-final on Saturday at Hampden and Paatelainen insists that he does not view it as an unwelcome distraction. "Obviously last weekend was a disappointment because we didn't perform," he said of the home defeat by Inverness Caledonian Thistle. "A couple of results didn't go our way, but they have a chance now to play in a semi-final and get to the final - a glorious opportunity to bounce back and play well. "We know we have plenty of boys in the dressing-room who will think like that. "It would give us a boost to look forward to a cup final." Hibs will themselves head for Hampden having suffered a slump in form during their bid for promotion from the Championship, but Paatelainen stressed that his former club, who beat United 3-0 in the Scottish League Cup quarter-final in November, "have the quality to hurt us". "They have very good players," he added. "Their squad is fit for the Premiership - and to do well in the top flight. "That's how good their players are - and they have a good management team."